The man who revolutionized the way we define phones, music, and mobile computing, has died less than two months after stepping down as Apple's CEO. Most people who visit Apple's homepage expect to find announcements of innovative products, services, and promotions. Sadly, on the day of its co-founder's death, they were faced solely with the following simple message: Steve Jobs, 1955-2011. Further within Apple's site, the company also posted a more personal goodbye. "Apple has lost a visionary and creative genius, and the world has lost an amazing human being," it read. "Those of us who have been fortunate enough to know and work with Steve have lost a dear friend and an inspiring mentor. 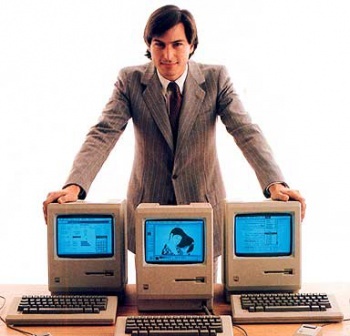 Steve leaves behind a company that only he could have built, and his spirit will forever be the foundation of Apple." Jobs had been struggling with failing health for years prior to his untimely death at only fifty-six years old. In 2004, he underwent surgery for a rare form of pancreatic cancer. Five years later, in 2009, he received a liver transplant during a six-month-long medical leave of absence. Then, in August of 2011, he stepped down as CEO of Apple. "I have always said if there ever came a day when I could no longer meet my duties and expectations as Apple's CEO, I would be the first to let you know," he'd said. "Unfortunately, that day has come." Though his resignation hadn't been announced as health-related, those words led many to believe that his recent turbulent medical history had been finally catching up with him. Though the official cause of death has been yet to be reported, his wife has come forward with a brief statement. "[He] died peacefully today surrounded by his family," she said. "We know many of you will mourn with us, and we ask that you respect our privacy during our time of grief." With more money than possible to spend in a lifetime, it's amazing to me that Steve Jobs spent his final years hard at work for Apple, and the millions of tech-consumers that patronize it, instead of resting quietly on the beach of an apple-shaped private island. Then again, I suppose some people just aren't built that way. "Remembering that I'll be dead soon is the most important tool I've ever encountered to help me make the big choices in life," Jobs once said to a group of Stanford graduates in 2005. "Because almost everything-all external expectations, all pride, all fear of embarrassment or failure-these things just fall away in the face of death, leaving only what is truly important."